Α strong industry of kid-friendly iPad accessories has blossomed along with sales of the tablet. YetYet is probably one of the most unique and interesting accessories I’ve seen. Maker Carnation Group promises to combine a stuffed animal with your iPad to create an interactive toy for your child. At its heart, YetYet is an enormously kid-proof iPad case. A little longer and wider than the tablet, the creature (as pictured) is covered with soft white fur and has bright-orange hands, feet, horns, and a tail. There are two openings on the creature, one large hole for the eyes and head and another for its heart. The case is also compatible with all three generations of the iPad. To get started, you need to download the free, Totoya Creatures app from the App Store. Once the app is launched, you can unzip the top part of the creature and insert the iPad. As a side note, you must turn off multitasking gestures on your iPad while using the app. Here’s a quick video run down of YetYet. Click here if you can’t see the video. Both parts of the experience, the app and creature, are well designed and definitely appeal to kids. As far as the creature goes, my first concern was how well iPad would hold up since the pocket looks to be only designed for a tablet without a case. But overall, YetYet is well designed to be both a cute stuffed animal and great protection for your iPad. The two openings are very deep and nicely padded. Around the top opening there is a very convenient blue carry handle that makes the creature easy for little hands to carry around. The app is also fun and interesting. Once launched, your child can interact with YetYet in a number of ways. Along with helping speak its “native” language, your child can change the creature’s color, have it repeat voices back with effects, brush its hair, and turn it into a cyclops. And thanks to the iPad’s built-in accelerometer, the creature also reacts to being turned on its side or upside down. 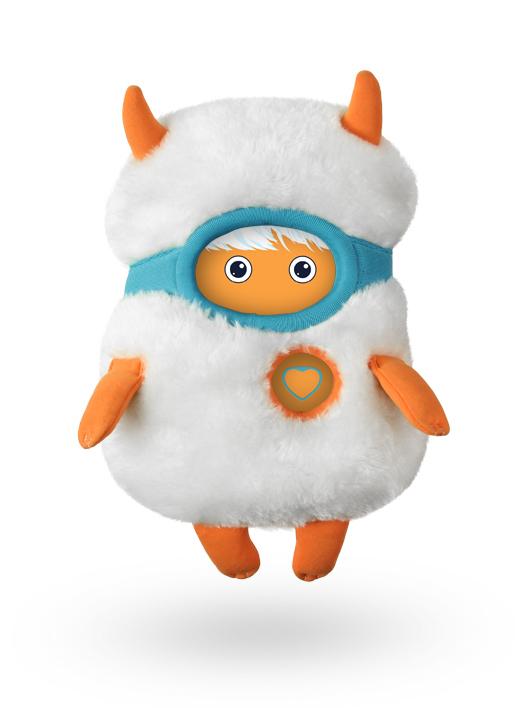 YetYet can be used as a stuffed animal even without the iPad since the creature has eyes sewn into its top opening as well. YetYet toy in dampened somewhat by its high, $79.90 price tag. The iPhone version of the case, YetX, is available for $49.90, but I suspect it would be hard to get the full, interactive experience with a smaller creature. Another, more boyish monster, Robotto is also available in the Totoya (not Toyota) Creatures lineup with the same pricing structure. The Totoya app also promises two other different creatures coming soon. So, if you’ve really got some money to spend, and want a fun way for your kids to interact with your iPad, YetYet is a joyful experience. If you’re on the fence, the app is free and a good way to test whether you want to go all in and buy the creature.